I saw the first, may have even seen the second. I'm sure I've not seen 3 to 7 but 8.. Wow! Astounded to learn of its first weekend box office record breaking but now I understand. THE FAST AND THE FURIOUS 8, aka THE FATE OF THE FURIOUS, is just deliriously entertaining. Camus is still smiling..
"This is definitely the biggest thing I've ever done. But of course. This vision is a vision that I think definitely serves the franchise, but it's from my point of view. I'd like to think that I know what the fans are expecting in terms of the spectacle, but with the tone, I had to bring my experience with drama and humor to tie it all together. So I feel really good about that. I'm really proud of this movie." And so he should be. 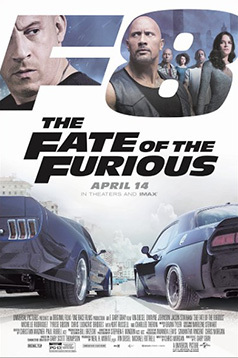 Hand on heart, The Fate of the Furious (or Fast and the Furious 8) is the most deliriously entertaining Hollywood film I have seen in years. It's exciting, it's very funny, it's ludicrously over the top and you just know that the filmmakers are well aware of this but the movie still manages to suture its tongue into its cheek and let chaos reign. But this isn't a mindless action picture. It's mindful in every way and one of the most satisfying two hours of escapism I think I've ever seen. It's so well crafted and so lightly scripted that there were belly laughs in the cinema last night and even a smattering of applause. Three of us came out of the dark and we were tripping over each other to say what we enjoyed about it. The final consensus? All of it. I know this site came into existence to champion the quality unsung movies, the bona fide classics, international cinema, the smaller low budget works and independent films but every now and again, Heston Blumenthal has a Big Mac. I've become the unofficial Hollywood mainstream reviewer mostly because it's an area in which I'm comfortable. But all too often you sit in the dark watching a demographic report's version of a motion picture - via a studio exec laden committee - actually designed to be a bloated CG spectacle to bring in the goodies for that all-important first weekend. They're depressing, committee movies.. If that really is the case here, I'd say job done. But this one feels like it's come from a single sensibility. There's only one credited writer, Chris Morgan, which for a movie of this size is rare indeed. I hope the sequel to Guardians of the Galaxy shows as light a touch. The night before, I was mildly entertained by the earnest but over designed Ghost in the Shell and couldn't really bring myself to write about it. My review would have been "Loved Scarlet, not too thrilled with the Robocop/Blade Runner mash up on steroids." I went to see Furious 8 last night with zero expectations (I wouldn't have gone on my own – not really my thing, fast cars and ripped machismo - but it was suggested as the topper to a lovely if wet social evening). Two hours later, I walked out of the cinema buzzing like a six-year-old savant building worlds in Minecraft on a new MacPro. I cannot supress a childlike glee when I think about its small and enormous gems. So few.. I repeat, so few films these days leave you smiling widely exiting the cinema. I am by no means anywhere near the demographic at which this film was aimed but I don't care. Its broad appeal should be its Achilles heel (Jack of all genres, successful at none?) but it plays the action card with breathless craft and verve and visual effects that you forget about because you're having too much fun; the comedy is character based (with one excellent teeth joke which I won't spoil), humour which some critics have taken exception to. Oh, come on folks.. Take any of this seriously and you're so missing the point, you're immune to being stabbed. And although you wouldn't shed a single tear for any of the characters - we are talking live action cartoon here - you care enough in a way to make the stakes worth something, and incidentally the stakes are nuclear in character, so in reality not so far away now from a ludicrous scenario. I think it's clear to those who visit this site regularly that we don't really go for big budget bloat but Furious 8 is that rare creature, a high functioning, smart, efficient crowd pleaser and these days, when smiles and laughter are at a premium, I can only give in to its abundant charms and invite you to do the same. The fact that Furious 8's opening weekend haul beat Star Wars The Force Awakens' says volumes. There is some argument about the latter's delayed opening in China that may have edged Abrams' film out into the lead if those tallies were included. To me, it's all about the people who saw the film on Thursday, got to tell more of their friends and saw it again with them on Friday and that word of mouth snowballs, being more valuable to the studio than any review. The fact I have not seen sequels 3 to 7 should also convince you that I'm serious about how good this film is. It's not nor ever will be The Seventh Seal (or even The Eighth Walrus). It's an escapist, popcorn crowd pleaser that really, really delivers. You want a plot synopsis? Are you kidding? That's not really the point but here we go anyway. After a movie I never saw (Furious 7), everyone's calmed down and Dom (Vin Diesel) is on his honeymoon in Havana with Letty (Michele Rodriguez). He races a local hotshot and wins (now there's a surprise) but while in Cuba he is approached by Cipher, Charlize Theron in another of her patented villain roles. She's very convincing but then she's a great actress regardless what piece of drama or fluff she's playing in. She shows Dom something on her phone.. It's enough to turn Dom against the 'Fast Fam' and to the filmmakers' credit, they don't keep the reason he would betray his 'family' a secret for very long. I imagined it would be a big third act reveal. Glad to be proved wrong. Dom is now working for Cipher and his team is mystified. So the action movie staple is brought out to play (the bomb shaped electromagnetic pulse machine that switches everyone's power off, as used in countless other action movies) but this is just act one. Dom betrays his team and saunters off with the device and joins Cipher on her airliner. The team is assembled by a suave Mr. Nobody (Kurt Russell reprising his role from F&F7) and they soon attempt to track down where Cipher's havoc will play out next. Her vanguard soldier, Dom, who seems so capable of escaping any situation and turning it to his advantage, is so close to superhuman, you couldn't pass a sheet of paper between him and a demi-god. But then Vin Diesel is playing to his strengths. He may not have great range but you can see when he's upset, pissed off and angry (mostly simultaneously) and as long as that is read easily, the whole world can understand. He may have been Groot and Riddick but Dom is his signature role, the tiger on whose throat Theron has her boot..
Dom's team try hard to catch him in the act. The New York zombie car set-piece is a slice of action so delirious, so joyous, so absolutely nuts that every other shot had me smiling at the invention and creativity of the filmmakers. In the nascent age of the driverless car, I warn anyone with any misgivings about conceding control to a machine, slip out when this sequence starts but be sure to come back in. But then again, you might miss Helen Mirren's uncredited cameo as a cockney mum, a powerful matriarch with sons Jason Stratham and Owen Wilson in thrall. It occurred to me that aside from Lock, Stock, I'd never seen a Jason Statham film. He occupies that Stallonian stratosphere where movies tell you what they are by their bicep-based casting and while I am happy for people to enjoy the machismo and the mayhem, I wasn't ever going to see Statham the thespian stretched nor would he have it any other way but, saying that.. His scene with the baby is a masterclass in surprise, understatement, comic timing, physical grace and lots of violence. 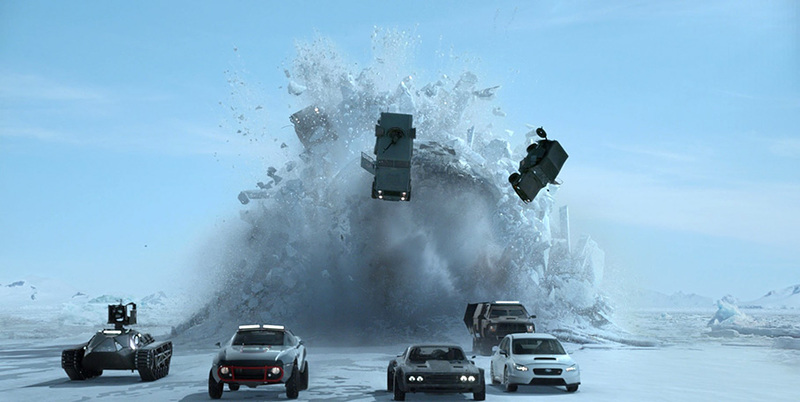 The action then moves to Russia and some serious ice plains where a remote controlled submarine is used as a weapon and a possible source of nuclear missile launching. To be fair to the villain, her ambition almost makes her a good guy. She wants to launch a nuclear strike to force the superpowers to be 'accountable' to the people. Now that's the only word she uses so the audience has to do a fair bit of work to unravel that. So she's going to explode a nuclear device somewhere (where?) and Trump and Putin suddenly do.. what exactly? No matter. What matters is the action and the comedy and they are both present in this last so-over-the-top-it's-weightless sequence that barrels along while you're still shovelling in that apparently small bag of popcorn. There is a perfect opportunity for Dwayne Johnson to deliver a knock out put down or Bondian quip as Rodriguez throws a man onto the spinning submarine propeller and cliché-style, blood spatters the wall. As he looks over I thought 'Here it comes,' and he just says "Nasty," which was perfect. I could imagine the writers holed up in a room stinking of fast food and shoe polish for weeks trying to come up with the perfect line. I love that they kept the delivery in character. They did well enough with Johnson's dialogue early on. This one would have been overkill. I must mention once more, writer Chris Morgan, the singular in more ways than one. Bryan Tyler's score is derived from the Jason Bourne school of action (take a bow John Powell) but serves the movie well enough. With the exception of the prepping to do some stuff scene, which was reminiscent of the main Bourne chase theme, I can't really recall the score as there was a lot of other sound going on at the time. Two Game of Thrones regulars turned up to strut their stuff on the big screen. Kristofer Hivju (he of the red beard and come hither looks towards Brienne of Tarth) acquits himself well and despite his physical presence, he is somehow diminished by standing next to the beefy Mr. Diesel for most of the movie. He was never going to stretch Vin in any kind of fight. But then we all knew that, right? Nathalie Emmanuel plays the digital expert yin to Cipher's yang. As the hand maiden of the Kahleesi, Daenerys (the dragon girl), she is in her element but here, she gets a bit lost in a large cast all vying for the limelight one smart line at a time. If things are getting you down (and things right now are heavier than ever) then risk a visit to Vin and company for two hours of smiles, laughter and "Wow! "s.